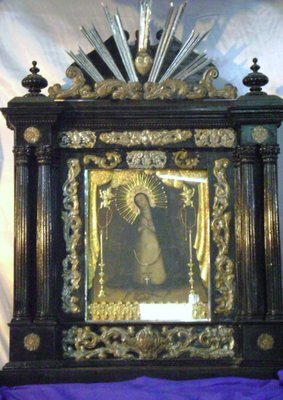 The Venerable Image of the miraculous Virgin of Solitude of Porta Vaga in Cavite Puerto, was miraculously saved after the beautiful church where She was venerated for more than 300 years was burned by the Japanese in 1945. She is now enthroned at the Church of San Roque where she is venerated with filial love by Her dear children in the city of Cavite. The Illustrious and Most Reverend Lord, Don Basilio Sancho de Santa Justa y Rufina, by the grace of God, and the Holy See, Apostolic Archbishop of the Philippine Islands, the Council of His Majesty, etc., grants eighty days indulgence to the faithful everytime they pray or assist in this Novena. Likewise, the Most Reverend and illustrious Lord Fr. Juan Antonio de Orbigo y Gallego, grants another forty days for those who do the same. And also the illustrious Most Reverend Bishop Jeremias J. Harty, Archbishop of Manila, on the 21st day of October 1909, grants 100 days of indulgence to all who make use of the prayers contained herein and the other 100 who make this novena. "We attach herewith to act as license to print in the Tagalog language manuscript entitled ‘Pagsisiyam sa mapagpalang Ina, na ang pamagat Nuestra Senora de la Soledad.’, in response to that as reported by the Censor that our Order has examined such, not contain anything against the dogma and morality, but rather deemed highly desirable for the pious reading of the faithful. Recorded for the Secretariat in testimony of this decree and filed the original subject. - Archbishop Gregory. " And for the record I give this to the Secretary signed in my office. Manila, August 3 of 1861. By the sign of the Holy Cross, from our enemies, deliver us, Oh Lord, our God. Virgin most sorrowful! I am aware of Your incomparable grief as well as of the deep pain that wounded Your loving heart during those three days of Your solitude, while Your Son, Jesus, lay dead and burried in the sepulchre, in order that I may be overwhelmed with sorrow for the many times that, through my serious offenses, I have expelled my Lord out of my soul. I am heartily sorry for all and each one of my sins, and I would even prefer death rather than commit any of them. But from now on, dearest Mother, I am resolved to ammend my life and avoid sin, hoping that Your Divine Son, who suffered a most ignonimous death for my sake, will grant me mercy, forgiveness of sins and a return to a life of grace. I also ask of you, my Mother, that I may receive these favors through the merits of Your painful solitude. Amen. Most aggrieved Mary, Mother of Thy most tormented Son! I am aware of the great suffering that pierced Your tender heart when, after depositing His lacerated body inside the sepulchre, those kind and pious men placed a heavy stone on its entrance and thus covered His mortal remains from Your view. Woe to me, dearest Lady, for they were my grievious offenses which caused so much torture and fatigue to Your pure heart. I beg of You, therefore, to intercede for me in order that I may obtain through the merits of Your painful Solitude, the grace of true repentance for my sins and the honor of being buried with Your Divine Son, together with all my disorderly passions and inclinations, for His greater glory and for the favor which I hope to obtain in this Novena. Amen. O Mother most disconsolate, grant me permission to stay in Your presence, since knowing that I am the cause of Your grief, through my grievious sins, I am filled with compunction and dare not show myself before You. Yet, knowing that You are the Mother of sinners, I beseech You to be a special Mother to me whom You now see weeping, contrite and begging pardon for my sins. And since You withstood by the Church and Her faith during those three days of Your Solitude, may She now triumph over Her enemies; the souls in Purgatory be released soon from their temporal punishment; and may I be numbered among Your faithful servants to keep company during Your solitude, in order that I may deserve Your valuable assistance at the hour of my death, and Your glorious company forever and ever in Heaven. Amen. Then follows the prayer and hymn to Our Lady of Solitude. obtain for me the necessary courage to carry on my work, to mortify myself in my desire for worldly pleasures, and to obtain the eternal glory in Heaven; and if it be for the greater glory of God and my own welfare, to grant me the favors which I hope to deserve through this Novena. Amen. O most afflicted Mother, I can feel the incomparable grief that shook Your innermost being when You descended from Mount Calvary while remembering that You ascended it some few hours ago on that same day, following the footsteps of Your most patient Son. If I could only shed tears of regret for the many times when, in company with false friends and listening to their insidious invitations, I have strayed away from my God and from the true path of life eternal. May I beg of you, my dearest Mother and Queen, the necessary light to understand the depth to which my bad examples have brought me, and, availing myself of the lessons taught to us in His passion, as well as in Your Solitude, may I tread on the path of the Commandments and of all virtues. And, if it be for the greater honor of God and for the good of my soul, grant that I may obtain the favors that I plead for in this Novena. Amen. O my most aggrieved Mother, who could ever comprehend the fathomless sorrow that pained your precious heart when, returning home in the afternoon and while passing through the passion road from Calvary, you could not but remember vividly the horrible scenes that took place that same morning, particularly what occured in the house of Pontius Pilate, the Roman Governor in Judea, until the sentence of death was executed on top of the mount. Those were memories that threatened to wreck Your mind and Your heart. May I be granted the grace to keep and perpetuate the same Passion and death of your Son, Jesus, in my memory in order that I may not make any step in the future that might not be in consonance with His love for me and with my gratitude for Him. Finally, if it be for the greater honor of God and the good of my soul, please intercede for me that i may receive the favors that i plead for in this Novena. Amen. against the exalted Person of the Messiah, crucifying Him to death, He who was their Redeemer and Benefactor. In the silence that gripped Your heart, You must have echoed anew the same sentiments of Your Son and expressed Yourself thus: “Poor Jerusalem! How you have wasted away so much joy and grace! What has my Son done to you to have deserved so much calumny and sacrifice?” I beseech You, my dearest Mother, to help me attain, through mercy, the necessary light to know the great malice to which I have fallen, in order that feeling sorry for my sins, I may avoid the punishment that is due to me. Finally, if it be for the greater honor of God and the good of my soul, may I deserve to receive the favors that I plead for in this Novena. Amen. O Virgin of dolours, how much you must have felt the Solitude that engulfed Your heart when You returned to the Cenacle after the burial of Your Son, remembering that only the night before, You had a talk with Him, and realized that He was no longer there, but in the damp darkness of hte sepulchre. With what loving devotion you must have kissed repeatedly the floor on which He had walked on! What could I do, O most benign Mother, in order to keep You company and console you? It was in this same Cenacle where Your Son, Jesus, gave His parting greetings the day before, knowing that on the following day, Holy Friday, He was to give you, instead, to all of us as our own Mother. And since I am one of these, Your children, and the most miserable, I beg of You not to exclude me from Your Maternal solicitude: keep me as Your Son, even if I am unworthy of the honor, and may I live and move as You would want me to. Finally, may I receive the favors which I ask of You through this Novena, if they be for the greater honor of God and the good of my soul. Amen. O most tortured Mother and Queen, now you are alone in Your dark room where everything around you seems to conspire to add greater weight to Your painful solitude. The night is long, and now that the Sun of Justice, Your Jesus, had breathed His last in the twilight of Calvary, you feel as if the light of joy would never brighten gaain Your days on earth. Oh, how different is this night from that other one when You conceived in Your womb the Son of God! Or that from that other night when You gave Him birth in the manger of Bethlehem! If only my past ingratitude would not add pain in Your heart, i would volunteer to keep You company in Your Solitude! I promise, therefore, to weep over my past sins and never to offend Your Son again, in order that i may deserve to receive His pardon and the grace to die first before I commit another sin. These favors I ask of You through this Novena, and I hope to obtain them, together with the other petitions of mine, if they be in accordance with the will of God and for the good of my soul. Amen. O most sorely tired Mother, how long and painful must have been the three agonizing days during which you waited for the resurrection of Your dead Son. And with what anxiety You must have yearned for the opening of that memorable morn when You would see Him again, this time, immortal and triumphant. With this burning trust in Your heart, You exercised the virtue of Faith believing in the promise of your beloved Son; Your hope made You await His glorious Resurrection; Your charity made You love Him all the more; Patience gave You strength to suffer Your Solitude; Resignation made You embrace Your sufferings, and finally, Your kindness to Your fellowmen led You to suffer all trials for them. Your edifying example, sweet Mother, gives me courage to pray for Holy Mother Church, for the christian nations and their leaders, for this City of Cavite, and for the entire Philippines, as well as for all of us here present and for those who are absent. May we all obtain for us the fruits of Your Solitude, through Your powerful intercession, including the favors which I ask of You through this Novena. Amen. for Her dearly beloved Son. to Your dearly beloved Son. You comforted Him in His suffering. In Your heart and soul. V. Pray for us, O Virgin most Sorrowful. O God, at Whose passion, according to the prophecy of Simeon, a sword of sorrow pierced the most sweet soul of the glorious virgin and mother Mary; grant in Thy mercy that we, who call to mind with veneration her soul pierced with sorrow, through the glorious merits and prayers of all the saints faithfully standing by Thy cross, may obtain the blessed result of Thy Passion. Who livest and reignest with Thee in the unity of the Holy Ghost, one God, forever and ever. Amen. Ang kapita-pitagang larawan ng milagrosang Birhen ng Soledad ng Porta Vaga sa Cavite Puerto, ay mahimalang naligtas matapos ang magandang simbahan Niya, kung saan Siya ay pinamimintuhuan sa loob ng mahigit 300 taon, ay sinunog ng mga Hapon noong taong 1945. Siya ngayon ay nakadambana sa Simbahan ni San Roque kung saan Siya ay pinipintakasi ng kanyang mga mabubuti at mapagmahal na anak sa Lungsod ng Kabite. Ang kanyang kabunyian at Lubhang Kagalang-galang na Señor Don Basilio Sancho de Santa Justa y Rufina, sa biyaya ng Diyos, at ng Lungsod ng Vatikano, Arsobispo ng Pilipinas, ang Lupon ng kanyang Kamahalan, atbp., ay naggagawad ng 80 araw na indulhensiya sa mga mananampalataya tuwing dadasalin o tutulong sa Nobenang ito. Gayundin, ang Lubhang Kagalang-galang at kanyang kabunyian Señor Fray Juan Antonio de Orbigo y Gallego, ay naggagawad ng karagdagang apatnapung araw sa mga gagawa ng gayon. At ang kanyang kabunyian at Lubhang Kagalang-galang na Obispo Jeremias J. Harty, Arsobispo ng Maynila, ngayong ika-21 ng Oktubre 1909, ay naggagawad ng 100 araw na indulhensiya sa lahat ng mga gagamit ng mga panalanging nakasaad dito at karagdagang 100 sa mga magnonobena. Upang maitala, ibinibigay ko ito sa Kalihim at nilagdaan sa aking tanggapan. Maynila, Agosto 3 ng 1861. Ang tanda ng Santa Krus, ipag-adya Mo kami Panginoon naming Diyos, sa mga kaaway namin. Sa Ngalan ng +Ama, at ng +Anak, at ng +Espiritu Santo. Siya Nawa. Lubhang namimighating Ina, natatalastas ko ang walang kaparang lumbay at kapait-paitang sakit na tumagos sa masintahin Mong puso sa loob ng tatlong araw ng Iyong pangungulila sa Iyong ginigiliw na si Hesus, nang ako ay maturuan Mo ng paghihinagpis dahil sa aking mga kasalanan na naging dahilan ng pagkawalay Mo sa Iyong Anak. Pinagsisisihan ko ang lahat at bawa’t kamalian ko at minamatamis kong mamatay muna sana ako bago magkasala sa Kaniya. Mula ngayon, kaibig-ibig na Ina, ay ipinangangako ko ang pagbabagong buhay at hindi na ako magkakasalang muli sa tulong ng Iyong mahal na Anak na dahil sa akin ay nagtiis ng di malirip na sakit at namatay na lipos ng karuhagian. Sa Iyo naman, Ina ko, ipinagmamakaawa ko na hingin Mo sa Kanya na pakamtan sa akin ang biyayang ito. Ipakita at ipaalala Mo ang dinalita Mong sakit sa pangungulila upang lalong mabalino ang Kaniyang masintahing puso. Siya nawa. Lubhang nahahapis na Ina ng lalong nagpakasakit na Anak, natatalastas ko ang dakila at lubhang mahapding sakit na dinamdam ng Iyong masintahing kaluluwa, nang ibaon na ang sugat-sugatang bangkay ng Iyong Anak sa libingan at matakpan ng mga maawaing tao ng isang malaki at mabigat na bato. Pagkalooban Mo ako alang-alang sa sakit at pangungulila ng masaganang biyaya at mangyaring lumambot ang matigas kong puso at matutong magbangon sa madilim na libingan ng aking mga kasalanan at mapasama sa libingan ng Iyong mahal na Anak, mapalibing naman ang masasamang hilig at layaw na pinipita ng katawan kong lupa, na mangyaring makamtan ko ang buhay na walang hanggan. At kung matutungkol sa lalong kapurihan ng Diyos, at sa kagalingan ng aking kaluluwa, ay ipagkaloob Mo sa akin ang biyayang ninanasa ko dito sa pagnonobena. Siya nawa. Alalahanin mo, oh lubhang mahabaging Birhen Maria na, kailan ma’y di narinig na may dumulog sa Iyong pagaampon, humingi ng Iyong tulong at nagmamakaawa ng Iyong saklolo, na Iyong pinabayaan. Dala ng pag-asa na ito, dumudulog ako sa Iyo Oh Birhen ng mga birhen, Ina, sa Iyo ako’y lumalapit, sa Iyo ako’y humaharap na makasalanan at namimighati. Oh Ina ng walang hanggang berbo, wag mo akong siphayuin, ang aking pagluhog, bagkus, sa Iyong habag, pakinggan mo ako at pakapakinggan. Siya nawa. Oh Inang labis ang kapighatian sa lahat ng ina sa mundo, bigyan Mo ako ng pahintulot na dumulog sa Iyong Mahal na harapan, sapagka’t nahihiya akong masakit at ang naging dahilan ng Iyong mga kalumbayan ay ang di mabilang kong mga kasalanan. Birheng Kabanal-banalan, Ina ng mga kasalanan, mag-asal Ina Ka naman sa akin yayamang nagsisisi na ako at humihingi ng tawad. At yayamang pinatnugutan Mo ang Santa Iglesya sa loob ng tatlong araw, gawin Mo naman ngayon na ako ay magtagumpay sa aking mga kaaway. Paging-dapatin Mo ako, katamis-tamisang Ina, na mabilang sa Iyong mapapalad na alipin na nakikiramay at nakikisama sa Iyong pangungulila upang mabago ang masama kong buhay. Tulungan Mo ako sa habang panahon lalung-lalo na sa oras ng kamatayan upang magpuri at magpasalamat sa Iyo at sa kamahal-mahalan Mong Anak doon sa langit magpasawalang-hanggan. Siya nawa. Nalulunod sa hapis na Ina, natatanto ko ang marahas na sakit na tumimo sa Iyong puso. Na sa pagbabalik Mo sa Iyong tahanan ay naraanan Mo ang kinatitirikan ng Krus na kinabitinan at kinamatayan ng kaibig-ibig Mong Anak na si Hesus. Sa aba ko, kaibig-ibig na Ina at iyong Krus na pinasan ng mahal Mong Anak sa balikat at pinasan naman ng nasugatan Mong puso ay ako nang siyang nagbigay dahil sa aking mga kasalanang mabigat, sapagka’t sa pagtanggi kong pasanin ang Krus dahil sa aking kalagayan at mga katungkulan ay pinanariwa kong muli ang sakit ninyong mag-Ina. Hingin Mo sa Iyong makapangyarihang Anak na ipagkaloob sa akin ang katapangan ng loob sa pagyakap ng krus ng mga kahirapan at makamtan ko ang korona ng kaluwalhatian ng Diyos at kagalingan ng aking kaluluwa, at ipagkaloob sa akin ang ninanasa kong kamtan dito sa pagnonobena. Siya nawa. Lubhang namamanglaw na Ina ng lalong nagpakasakit na Anak, natalos ko ang walang kawangis na kalumbayan na umapaw sa Iyong pusong mahal. Nang manaog ka sa bundok ng Kalbaryo na ginugunam-gunam ang Iyong pagsalunga noong umagang Ikaw ay sumunod sa Iyong lubhang mapagtiis na Anak. Sa aba ko, mapagkalingang Ina, kung matutuhan ko sanang tangisan ang masasama kong pakikisama na ikinawawalay ko sa Diyos at dahil sa pag-alinsunod sa mga masasama nilang kahatulan ay napasinsay ako sa kabulusang daan sa langit na dapat pagpilitang tuntunin sa paghanap kay Hesus. Ipinagmamakaawa ko sa Iyo Ina Ko’t Panginoon na hingin Mo sa Iyong mahal na Anak na bigyan ako ng kaliwanagan ng isip upang makilala ko ang mga kapahamakang aking kinabubuliran. At kung magiging marapat sa kapurihan Niya at sa kagalingan ng aking kaluluwa, ay ipagkaloob naman sa akin ang biyayang ninanasa ko dito sa pagnonobena. Siya nawa. Lipos ng pighating Ina ng lalong nahirapang Anak, aling isip kaya ang makatatarok ng kalumbayang taglay ng masintahin mong puso nang lumakad Ka sa lansangan ng kapaitan na dinaanan ng Iyong pinahirapang Anak. Nagbabalik sa Iyong alaala at nagdudulot sa Iyong puso ang mga sakit, kahirapan at katampalasang tiniis ng Iyong giliw na si Hesus ng Siya ay dalhin sa pagpapakuan na siyang nagbigay ng lalong mataas na uri ng Iyong pagtitiis. Ina ko, susun-susong sakit ang nagpapahirap sa Iyong isip. At yayamang limot na limot ako ng madla, ipinagmamakaawa ko sa Iyo, Ina ko’t Panginoon, na ilimbag Mo sa aking kaluluwa ang Kaniyang mga kahirapan doon sa lansangan ng kapaitan, upang kung dilidilihin ko ang maralitang pasyon ni Hesukristo, at ang Iyong kahirapan ay wala akong gagawin kundi ang pagganti sa dimalirip Ninyong pagsinta. At kung nararapat sa lalong kaluwalhatian ng Diyos at sa kagalingan ng aking kaluluwa, ipagkaloob mo naman sa akin ang ligayang ninanasa ko dito sa pagnonobena. Siya nawa. Tigib ng hapis na Ina ng lalong nagdusang Anak, sumusubong parang tubig ang mga kapighatian ng Iyong dalisay na puso, sapagka’t noong gabing Ikaw ay pumasok sa tampalasang siyudad ng Herusalem ay nakita ng mga mata ng Iyong maliwanag na isip ang sasapiting kapahamakan ng dakilang siyudad dahil sa di malirip na sakrilehiyo na ginawa sa araw na iyon, nang pinatay ang tunay na Mesias. Sa laki ng Iyong paghihinagpis, ay nawika Mo ito: “Kahabag-habag na Herusalem, bakit mo sinayang ang iyong kapalaran? Anong kasamaan ang ginawa sa iyo ng Aking Anak at tinampalasan mo at pinatay?” Ipinagmamakaawa ko sa Iyo, Ina ko’t Panginoon na hingin Mo sa Iyong mahal na Anak na pagkalooban ako ng kaliwanagan ng isip upang makilala ko ang aking mga kasalanan gayon din naman ang parusang nararapat sa akin at nang mapagsisihan ko nang taos. At kung nararapat sa lalong kapurihan ng Diyos at kagalingan ng aking kaluluwa ay ipagkaloob Mo naman sa akin ang ninanasa kong kamtan dito sa pagnonobena. Siya nawa. Lubhang nahahapis na Ina ng lalong nagpakasakit na Anak, hindi kaya lalong naragdagan ang Iyong pamamanglaw sa pagpasok Mo sa bahay sa Senakulo, sapagka’t naaalala Mo yaong sinundang gabi na ang Iyong mahal na Anak ay kasama Mo at nakausap at saka ngayon ay wala na Siya at iniwan Mong nalilibing sa lupa? Ina ko’t Panginoon! Ano ang dapat kong gawin upang maaliw ang Iyong may pighating puso? Sa bagay na ito nagpaalam sa Iyo si Hesus noong Huwebes ng gabi, sapagka’t natatalastas na kinabukasan at itatagubilin sa Iyo na ariin Mong anak ang lahat ng tao. At yayamang ako ay siyang kahabag-habag sa lahat ng tao, ay huwag Mo akong pabayaan at tanggapin Mo akong anak bagama’t hindi karapat-dapat. Hingin Mo sa Diyos na habang panahon ay wala akong gawin kundi ang inaasal at ginagawa ng mga mapapalad Mong anak at kung nararapat sa lalong kapurihan Niya at kagalingan ng aking kaluluwa, ipagkaloob Mo naman sa akin ang biyayang ninanasa ko sa pagnonobenang ito. Siya nawa. O nangungulilang Ina sa lalong kaibig-ibig na Anak! Hanggang saan sasapit ang Iyong kapighatian at parang hindi sapat ang gayon, ay inibig Mo nang magtiis na mag-isa. Ina ko’t Panginoon, hindi Mo ako tatanggihan sa ninanasa kong pakikisama sa Iyong mga kapighatian na hinihingi ko sa Iyo mula sa kaibuturan niyaring puso. At habang tinatangisan Mo ang kamatayan ng Iyong Anak, tatangisan ko naman sa piling Mo, ang naging dahilan ng Kanyang kamatayan na walang iba kundi ang aking mga kasalanan. Ipamagitan Mo ako sa Diyos na sa mga kahirapan at karalitaan sa buhay na ito ay huwag kong hanapin ang kaaliwan sa mga kinapal kundi tularan ko Kayo sa Inyong pagtitiis. At kung nararapat sa lalong kapurihan ng Diyos at kagalingan ng aking kaluluwa, ay ipagkaloob Mo naman sa akin ang biyayang ninanasa ko sa pagnonobenang ito. Siya nawa. Lubhang nahahapis na Ina ng lalong pinasakitang Anak, naririyan Ka at nag-iisa sa mapanglaw na silid at pinagbubuntuhan Ka ng lahat ng kapighatian. Ang mapanglaw na gabi ay nagsasaad sa Iyo na ngayon ay lumubog na ang araw ng katuwiran, na si Hesus ay naroroon sa Kalbaryo. Natapos na sa Iyo ang lalong maligayang araw na iyon na nagbigay ng kaaya-ayang kaliwanagan. Paano ang gagawin kong pag-aliw sa Iyo, paglilingkod at pamimintuho kung makita Mo ang karamihan ng aking kasalanan at pagkawalang loob na siya pang lalong nakaragdag sa Iyong kahirapan? Datapuwa’t kung tangisan ko kaya ang mga kasalanan ko, pahintulutan Mo kaya ako na Ikaw ay samahan ko sa Iyong kapighatian at pamamanglaw? Ipamagitan Mo ako sa Diyos ng kapatawaran at isang lubhang matibay na pagtitika na piliin ko muna ang kamatayan bago magkasala sa Diyos at kung nararapat sa lalong kaluwalhatian Niya at kagalingan ng aking kaluluwa, ay ipagkaloob mo naman sa akin ang biyayang ninanasa dito sa pagnonobena. Siya nawa. Nangungulilang Ina ng lalong marilag na Anak, anong pagkatagal-tagal ang damdam mo doon sa tatlong araw ng Iyong paghihintay sa pagkabuhay na muli ng namatay Mong Anak. Gaanong pananabik ang nasa Iyong loob sa paghihintay na sumikat na yaong mapalad na araw ng tuwa at makita mo Siyang maluwalhati at nagtatagumpay? Gaanong kalaki ang mga kabanalang ginawa Mo? Dahil dito ay umaasa ako, O mapagkalingang Ina, na diringgin Mo ang aking panalangin. Bigyan mo ng kapayapaan ang Santa Iglesya, itong buong sangkalupaan, at itong pook na kinalalagyan ng Mahal Mong Larawan. Kaawaan Mo at kahabagan ang lahat ng nagsisidalaw rito at lahat ng nangabubuhay at nangamatay na tao ay mangyaring magkamit ng Iyong tulong at sa katapusan ay ang kaluwalhatiang walang hanggan. At kung nararapat sa lalong kaluwalhatian ng Diyos at kagalingan ng aking kaluluwa, ay ipagkaloob Mo sa akin ang biyayang ninanasa ko dito sa pagnonobena. Siya nawa. V. Ipanalangin mo kami Birheng lubhang Nalulumbay. O Diyos, na sa Iyong paghihirap, ayon sa hula ng propetang si Simeon, ay tatarak ang balaraw sa katamis-tamisang kaluluwa ng maluwalhating Birhen at Inang si Maria; Itulot Mo, sa Iyong awa, na nawa kami, na umaalala at nakikiisa sa aming pamimintuho sa Kanyang kaluluwang tinigib ng hapis, sa pamamagitan ng karapatan at ng panalangin ng lahat ng mga banal na tapat na nakipagtiis sa paanan ng Krus, ay makinabang sa banal na bunga ng Mahal na Pasyon ni Kristo, na nabubuhay at naghaharing kasama Mo sa kaisahan ng Banal na Espiritu, iisang Diyos, magpasawalang hanggan. Siya nawa. Sa Ngalan ng +Ama, at ng +Anak, at ng +Espiritu Santo. Amen. Es prenda tu Nombre de júbilo y paz. Luz de Filipinas, protégenos sin fin.